I’m currently suffering the effects of staying up too late and being surrounded by freshers who have ventured to Leeds from all over the country carrying with them all kinds of germs. Yes, I have the freshers week cold (I won’t call it flu firstly because it isn’t and secondly because I’ll be labeled as a wimp because apparently all men say they have flu when they just have a cold). I’m hoping to shake this soon as feeling like a pile of junk when you’re trying to get the work of two people done on your own isn’t all that helpful. Secondly I’m heading down to IBM in Hursley tomorrow for the two day thinkpad challenge where myself and fellow students from the school of computing have a chance to wave the flag for Leeds, prove we are the best and walk away with free laptops. Luckily Heather is looking after me, which I’m very grateful for. I’m having dinner cooked for me tonight and home made lemonade brought over later, the vitamin C from which should work wonders. Heather is truly wonderful and I’m dead lucky to have her. My past week has been spent working in my capacity as president of Jazz and Blues Leeds to recruit new members to the society and I’d like to report that it has gone particularly well. Our publicity consisted of running s freshers week stall all week, on one day having a stall in two places, holding a free gig in the outside tent and handing out over 2,000 flyers, each one coming with comments from me about what we had coming up and how our social consisted of free food and drink. We had our first social on Thursday evening and at the end of the night I’d met a load of great people who were as into Jazz and Blues music as me if not more so and also added over 65 paid members to the books. This financial injection is going to ensure the future of Jazz and Blues Leeds for the coming months and provide us with the ability to deliver some of the best jazz and blues events that Leeds University Union has ever seen. Finally some scientific evidence to support those of us that love a few pints of the good stuff now and again. 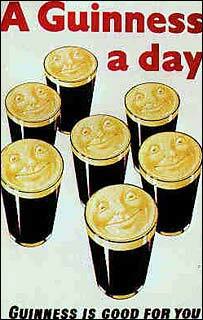 Apparently a pint every day could present sinilar positive benefits to that of the common aspirin tablet such as thinning the blood to prevent clotting and reducing the amount of cholesterol deposited on the artery walls. All is revealed in this BBC news article. Even if you choose not to believe this, there certainly can’t be any harm in drinking a pint and thinking it might be doing you some good rather than harm, it simply enhances the enjoyment of your pub visits! Casting all that aside I certainly wouldn’t half mind my own copy of the featured poster on the left. This is a small blog post aimed at those who have ended up graduating earlier than imagined, according to facebook that is anyway! There is however a very simple fix for this. After following these steps you should cease to be an alumnus on your university network on facebook. Have fun! I’ve been a long time listener of Pandora, and while I’ve been sharing with you what I listen to on my home hi-fi in the sidebar of my site for some time, I’m now sharing my Pandora listening habits across facebook. What this means is my facebook profile updates when I start listening to a different radio station and what’s more it gives you a link to listen to exactly what I’m listening to, plus some album/artist art to spark your interest if the name of the station alone isn’t enough. If you’re into Jazz and Blues music I’d strongly recommend any of my stations to you. Please feel free to post up your comments on my Pandora stations to this blog post. A few days ago I was contacted by the new promoter of events at the Wardrobe jazz club and it looks like we may finally be seeing some improvements at the club. I’ve been given a preliminary event listing for the next few months and it all looks very positive. I’m hoping to try and work closely with the Wardrobe when planning events for the Jazz and Blues society and perhaps together we can help bring some superb jazz and blues to the university and indeed to the whole of Leeds. While the frequency of events at the Wardrobe doesn’t seem to be returning to what it once was, it does look like we have a little more jazz in Leeds to get our teeth into and that can’t be a bad thing.